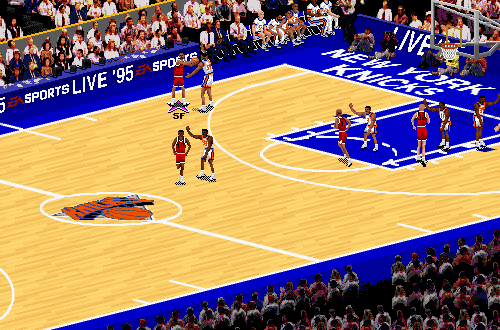 We’re tipping off our series of retrospectives with a look at the game that started it all: NBA Live 95. The game is often remembered fondly by long-time basketball gamers; beyond its significance as the first game in the NBA Live series, it’s also generally considered to be a classic. However, looking back on it twenty years later, it’s certainly fair to wonder…is that reputation justified? Just how well does NBA Live 95 hold up today? Let’s find out. If you’re a regular reader of my Friday Five column, you can probably guess what my answers to those questions are going to be, but let’s not get ahead of ourselves. Released on the Super Nintendo and Sega Genesis/Mega Drive in 1994, and arriving on the PC in 1995, NBA Live 95 wasn’t just a re-branding of EA Sports’ basketball series; it was a huge step forward. As I’ve mentioned in the Friday Five, it was one of the biggest leaps a basketball game ever took over its predecessor, that being NBA Showdown 94. Showdown 94 bridges the gap between NBA Live and EA’s original NBA video games, the NBA Playoffs series. However, while the name had changed with NBA Showdown, not much else did. The presentation and the gameplay were not markedly different from the games that came out a couple of years before it, such as Bulls vs. Blazers. To be honest, there had been fairly minimal improvement since Lakers vs. Celtics, way back in the late 80s. Now, video games have come a long way in the past couple of decades, and whenever you go back and evaluate an old title, it needs to be put in the appropriate context. The technology wasn’t as advanced, and gaming itself was still something of a novelty. Those old basketball games still aimed to properly represent the sport, but the technology and demand to provide the kind of deep experiences that we now expect of the annual NBA releases simply wasn’t there yet. 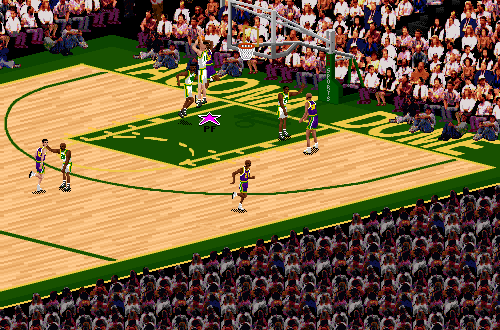 At the time, a game like NBA Showdown 94 was, at the very least, fairly adequate. That’s what makes NBA Live 95 so impressive. After four NBA Playoffs games without much improvement year-to-year, the new NBA Live series overhauled everything…and I mean everything. A brand new isometric camera angle was introduced, with the game’s visuals and presentation showing great improvement across the board. Player movement was freer and more fluid, and collisions were better. Defenders could be eluded, and players didn’t just stick to each other and stop dead in their tracks. Animations were better, the strategy was better…everything was just so much better than it was in the games that came before it. As such, NBA Live 95’s reputation is well-earned. At the time, it represented a far better attempt at replicating NBA basketball – it was the standard, the benchmark – and we all had a lot of fun with it. Even a few years into the NBA Live series, my cousin and I found ourselves going back to it to play with the teams of 1995. The next few games that followed had their own improvements, which I’ll talk about when we get there, but the fact of the matter is that NBA Live 95 held up quite well until the next big step up in gaming technology. In its day, I would say that yes, it absolutely was that damn good. It’s interesting to compare the console and PC versions of the game. On the whole, the PC version is superior: it has better graphics and audio, actual 1994/1995 season rosters instead of the 1993/1994 squads featured in the console versions, you can trade every player in the game instead of just the starters for each team, and of course, we were able to patch it. Having said that, the console versions have far better controls. While the keyboard obviously has plenty of keys at its disposal, and multi-button PC gamepads were not exactly rare at the time, the PC version’s controls were greatly simplified. How, you may ask? Well, there wasn’t a steal button. Yes, really. The handcheck button that the console versions had was also missing. 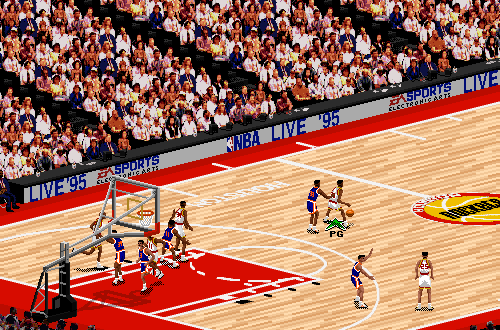 Instead, you could knock down players in the PC version by running into them with turbo; as for steals, defenders would automatically swipe at the ball when they were close enough. Needless to say, that was kind of a pain. 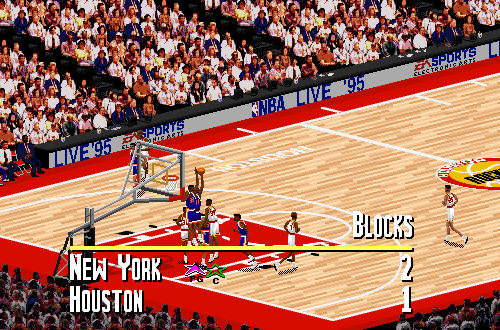 Aside from the controls however, the gameplay was more or less the same in both versions, and once again, NBA Live 95 played a pretty good game of basketball for its day. I can say that with confidence because when you go back and play it today, it actually holds up surprisingly well. When you pick it up for a game or two, and try to play it like you would today’s more advanced and realistic NBA games, it does at least try to play along. Well…kind of. It’s obviously far more primitive, but whereas its predecessors were primitive attempts at making simulation basketball games, NBA Live 95 is a primitive version of the simulation games that we’re playing today. Don’t get me wrong, the quality is nowhere near the contemporary standard, but strange as it may sound, NBA Live 95 has far more in common with recent games than it does NBA Showdown 94. While I certainly wouldn’t choose to play it regularly over anything that’s come along in the past decade or so, it’s still more than playable, and its strengths are definitely apparent. NBA Live 95 included, or indeed introduced, several features that we take for granted today. Individual player ratings, with the intention of giving players their real life abilities, and allowing those skills (or lack thereof) to be easily identified by gamers. The ability to make trades and create custom lineups. Custom teams. Playbooks and strategy options. Instant replay. For the time, it was a very well-rounded game, a lot of fun, and far more realistic than its predecessors. Of course, when you go back and play it today, you’re also reminded of some of the more annoying issues of the day. As I said, the PC version’s limited controls were frustrating. Because steals were automatic, it was easy to pick up reach-in fouls that you might have otherwise avoided. While the gameplay was more realistic and strategic than the likes of Showdown, it still pales in comparison to what we’re used to these days. It’s also pretty brutal on All-Star difficulty, which at the time was the highest setting available. Even today, NBA video games are still striving for AI that plays a smart game of basketball that is challenging because of superior strategy, rather than simply benefitting from an unfair advantage. With far less sophisticated technology at its disposal, NBA Live 95’s AI sometimes has to cheat like a spoiled brat to remain in the game, and that’s without the CPU Assistance setting toggled on. Contrary to Da_Czar’s creed, to win back then, there were times when you’d definitely have to play a video game rather than basketball. Immediately before I started writing this retrospective, I played a full length game as the Chicago Bulls, taking on the Orlando Magic. After falling behind 44-22, I ultimately came back to win 134-129. Despite it being a high scoring affair for a regulation game, the shooting percentages for both teams wasn’t too unrealistic. On the other hand, the Magic had 30 blocks, and there was a total of 91 assists between the two teams. Guards block shots a little too easily, and although passing and dribbling ratings do matter, you can pretty much run the offense with anyone. Still, those were still the early days of basketball sims, and while I was reminded of how far basketball gaming has come, I could also still appreciate the amount of realism that NBA Live 95 had. Honestly, I had fun going back and playing it again, especially with that very satisfying come-from-behind victory. To make it happen though, I did have to play a little looser from a sim perspective, but it was still an enjoyable experience. Granted, there’s a healthy amount of nostalgia involved, but like I said, NBA Live 95 does in fact hold up surprisingly well. 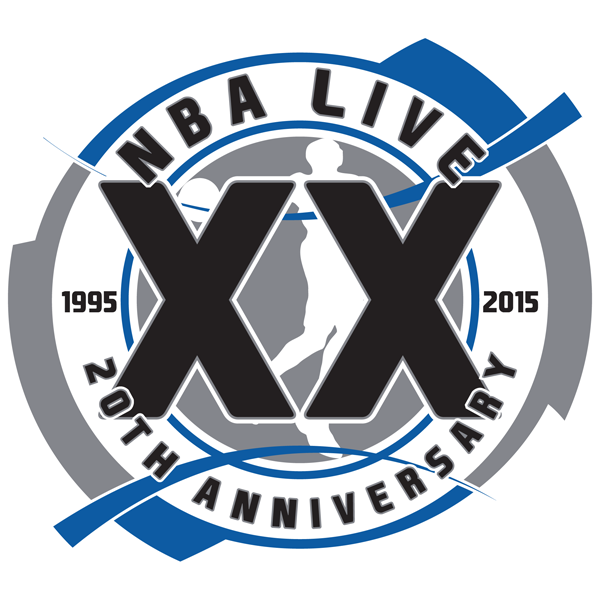 Before I wrap up, I’d like to talk a little about editing NBA Live 95, since it was the game that tipped off our patching culture here at the NLSC. 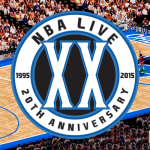 Tim, Lutz, and Brien all released utilities for NBA Live 95, which you can still find in our Downloads section. It was a tough game to update, though. To add new players, you’d need to make use of existing names in the text strings, and overwrite names to add new ones. To that end, you had to make sure that you weren’t going to overwrite the name of a player, team, or college that you still intended to use. There was a lot that you could do once you were proficient at editing the text strings, but looking back, it really makes you appreciate the editors the guys made for NBA Live 96 and NBA Live 97, not to mention the DBF files we got to work with starting with NBA Live 98. It definitely wasn’t my favourite game to patch, but at the same time, I kind of enjoyed the challenge of it. Some random player related trivia: although he had appeared in the NBA Playoffs games, and NBA Showdown 94, Michael Jordan was not featured in NBA Live 95, or any game in the series until NBA Live 2000. Charles Barkley, who had also appeared in Showdown, declined to appear in NBA Live 95, and would not appear in the official rosters until NBA Live 98. David Robinson appeared in the console versions of NBA Live 95, but did not appear in the PC version; he would not be absent from NBA Live for the rest of his active career, and has appeared as a Legend in a couple of games afterwards, most recently as a collectible player in Ultimate Team. Speaking of roster oddities, since the PC version’s rosters had been updated through the trade deadline, Clyde Drexler was on the Houston Rockets, but as their sixth man. The Glide did come off the bench in his first game for the Rockets, but immediately moved into the starting lineup thereafter. Brad Daugherty and Gerald Wilkins meanwhile were included on the Cleveland Cavaliers’ roster, despite both of them being ruled out for the entire 1995 season. However, as there were no inactive rosters in NBA Live 95, and they were noteworthy players, this was probably for the best. 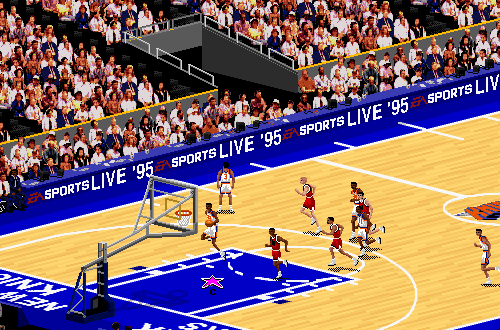 When I think of NBA Live 95, I think of a great basketball game that set the standard for EA’s basketball franchise. I recall having hours of fun playing it, and the rush you’d get when a player threw down a dunk and then ran back down the court pointing at the opponents. It absolutely deserves to be considered a classic, and even though it has long been surpassed, it remains one of my all-time favourite basketball games. 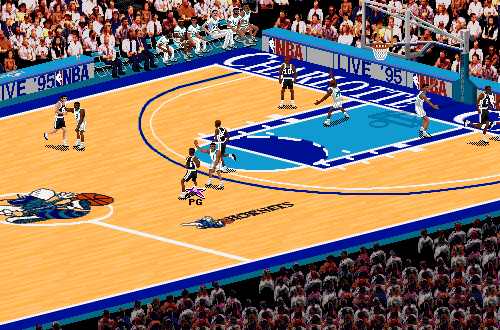 The NBA Live series has had its up and downs, but with NBA Live 95, it got off to a tremendous start.